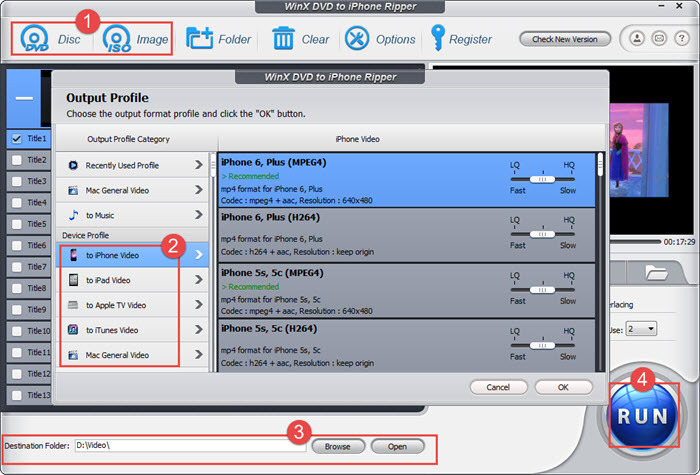 How to rip and convert DVD using WinX DVD to iPhone Ripper? WinX DVD to iPhone Ripper is specially designed to rip and convert DVD to iPhone (iPhone 5/6/6 Plus/SE/7/7 Plus), iPad/Air/mini/Pro, iTunes and Apple TV. This DVD iPhone ripper supports all homemade and commercial DVDs and compatible with all copy protected DVDs, including CSS, region code, RCE, Sony ArccOS, UOPs and Disney X-project DRM. It costs only 30 minutes to rip a 2-hour DVD movie to iPhone. With it, you can freely enjoy DVD on your Apple portable devices anywhere and anytime. Follow this tutorial to rip DVD to iPhone, iPad, iTunes and Apple TV. How to Rip DVD Disc to iPhone, iPad or Apple TV with This DVD iPhone Ripper Software? Free download WinX DVD to iPhone Ripper. Launch the program and load the DVD Disc by clicking "DVD Disc" from your DVD Disc, or load DVD ISO image from HardDisk by clicking "ISO Image". Select one Apple device as you wish, like DVD to iPhone, DVD to iPad, DVD to Apple TV. Start ripping. You can view the conversion progress and are able to cancel the converting process at anytime. How to Rip DVD If Your DVD is Adopted with the Latest DVD Copy Protection? The lastest protected DVD by Disney, Paramount and Warner usually has 99 titles and the DVD movie size is larger than 40 GB. WinX DVD to iPhone Ripper can perfectly remove such strong DVD Copy Protection. After you import the DVD, the software will automatically detect the correct title so that you can rip DVD from the main movie content with correct order. You can also choose DVD title manually. Play the DVD movies first with DVD player software.Then when it comes to main content of the movie, please check the DVD title and record the title number. Find the title number you record and tick it. Select your targeted Apple device and destination folder. You are good to go! Choose "CPU Core Use" or "Force A/V Sync". 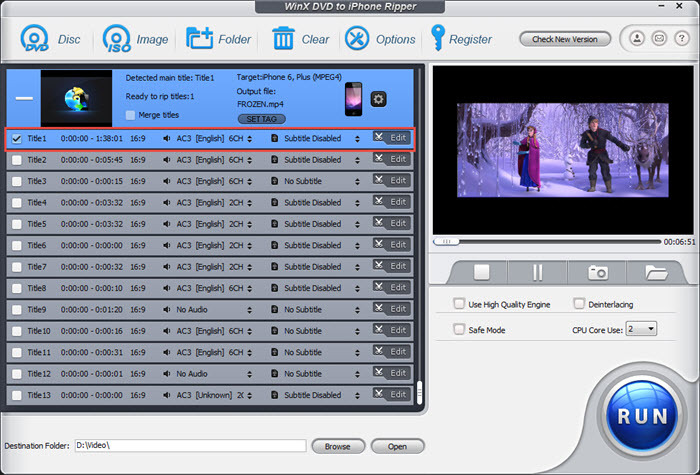 A. WinX DVD to iPhone Ripper has a unique feature to make target video display with proper file name on iPhone/iPad/iTunes/Apple TV. Import DVD file, and select the output format. Then click "SET TAG" to edit video file name. A. Import the DVD Disc, and select "to Music" button. You will be able to extract the background music as MP3/AAC/AC3 or other music file.